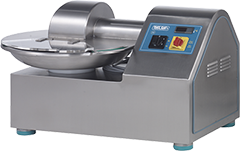 The TALSA K15 Bowl Cutter is designed for the production of sausage hash of all kinds, for small to medium slaughterhouses and industrial meat processors. The K15 table top bowl cutter or bowl chopper is also suitable for a wide range of poultry, fish, pastry or vegetarian products, processed cheese and many commodities in the food processing industry. Table top bowl cutters – choppers are the smallest of the commercial bowl cutter – chopper machines usually offering bowl capacities no larger than 15kg or 30lbs. These table top bowl cutters – choppers are also referred to as buffalo cutters or buffalo choppers. This type of bowl cutter v- chopper is ideal for a large restaurant kitchen and smaller commercial food processing facilities or test labs. With available options like variable speed cutting blades and 6 knife blade sets these smaller bowl cutter – choppers can be configured to be very versatile. They can be used to prepare meat products to become chopped or emulsified for use in a variety of sausage products, vegetables for different types of salsa, different nuts and dried fruits for humus, butters, fruit paste as well as cheeses for cream cheese or with a few adjustments prepare a large batch of scrambled eggs or turn surplus dried bread into croutons. Bowl cutters – choppers are the commercial and industrial version of the home food processor. Contact R A Maxwell in Corona California and we will teach you and train your staff on all the methods and products that can be processed with an industrial, commercial or table top bowl cutter-chopper, buffalo cutter or buffalo chopper.